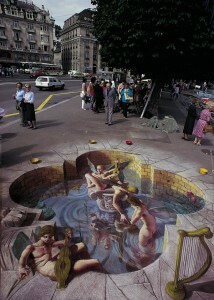 While still very young I was the featured artist in National Geographic’s documentary, Masterpieces In Chalk. The film won many awards and helped to resurrect and spread pavement art across the globe. While working on the street painting for the film, I had to confront the nature of my own creativity. I wanted to demonstrate that I was capable of inventing original compositions on the spot, so I deliberately didn’t make any sketches for the piece I was to create. I had been accused many times by onlookers of copying Renaissance paintings, and the public often refused to believe that I created my own unique original compositions. Creating an original work of art is novel in the world of street painting, and it was important to me that the director Kevin Peer captured this in the documentary. My method of working at the time was entirely spontaneous, much to Kevin’s concern, as the director he was hoping to see some preliminary drawings. It was difficult for Kevin to accept this approach, as he would have no way to know if a spontaneous creation would end up being good enough for the film. I decided to paint the Muses, which as a theme lent itself to improvisation. The Muses also symbolize the idea that even though works of art are ephemeral, the inspiration behind them is immortal. Inspiration may be lost or forgotten, but it is eternally present whether or not we are able to perceive it. Whenever I create a work of art, I can feel inspiration come through me–it is what creates the ideas behind my work; I don’t generate the ideas themselves.